As the Loring Park Campus of Wooddale Church ended Sunday worship on March 16, 2017, we interrupted the order of service to drop a banner and hold a worship service of our own. Offering communion and footwashing to all, we unveiled a banner during worship that read, “(Y)our Queerness is made in the image of God. 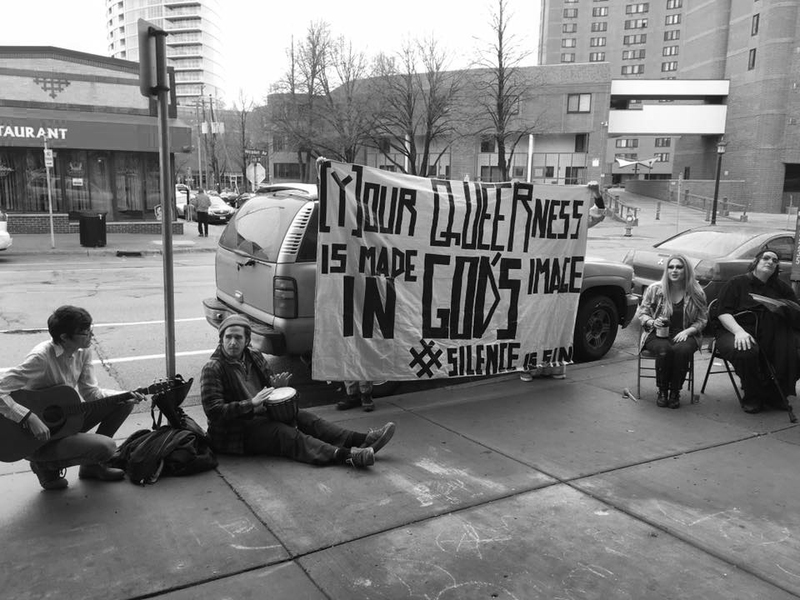 #SilenceIsSin”, confronting the way in which many churches have ignored the epidemic of LGBT youth homelessness or the growing incidents of violence against transgender women. 40% of the homeless youth population are LGBT…many kicked out by parents whose actions are inspired by their religious beliefs. Some churches endorse such suffering. A few speak out. But most churches remain silent and silence is deadly. Just as Black Lives Matter has employed a politics of disruption to raise the national alarm about racist policing…just as the water protectors at Standing Rock have created a human barrier against pipeline construction…so too, should we disrupt and confound any and every congregation that fuels militarism, economic exploitation, sexism, racism, Islamaphobia, or transphobia.